Wow, I can't believe I went a week without posting... its not that I've been busy... quite the opposite really. I guess the tedium of being back at work made each day feel the same so I didn't really have much to say. 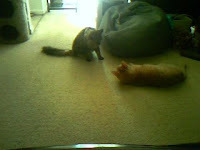 We also played with our new cat Tripsie (Originally named Sweet Pea, then named Tripod) Sam calls her "Manhands" because her paws are bigger than Kitty's. Kitty wasn't too sure at first, but she looooooves him, and he's getting more used to her. And! Yesterday was LAG 20! We had lots of fun, I mostly played Command and Conquer with the computer, while everyone else played Call of Duty, or Rock Band. 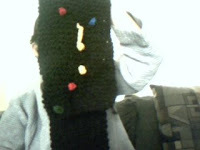 I did work on my super not-so-secret anymore project, which is a Rock Band Scarf! I'm still not 100% thrilled with that shade of green.... My knitting may be featured in a video from the event. YAY! Also working on a purse for myself. Its a design I made up after seeing one about a year ago shopping with my mom. *crosses fingers that it will work* Its so pretty, the yarn looks like pink cotton candy dipped in hot cocoa.